..Is Holland’s only tulip farm & perennial garden. In 1950 Vern Veldheer started a hobby farm with 100 red tulips and 300 white tulips, today Veldheers plants over 5.5 million tulips for you to walk through and enjoy. Perennials and flowers are brought in from around the world for you to buy and plant in your gardens. Our philosophy is that each client and their yard are important. 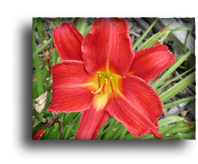 Quality is the number one reason in choosing Veldheer's plants for your yard. Veldheer’s staff is here to help you make the right choices for flowers and plants so your garden can be better than Martha’s. We encourage you to plan a visit to our spring gardens during the last week in April until the middle of May. When you visit our farm not only will you see five & a halh-million tulips in bloom, but 50,000 daffodils, 10,000 hyacinths and 20,000 crocus all providing a continuous parade of color for the garden enthusiast. Tulip Bulbs are only avaiable in the fall. Order them today by ( phone, fax, in person, snail mail, or @ perennialtulips.com ) for delivery this fall. 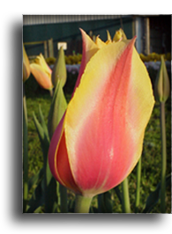 Plant Tulips 6" deep 6" apart (5 bulbs to the square foot). Enjoy your blooms in the spring. Veldheer's Tulip Garden offers everything a home owner needs for their yard, from bedding plants to statuary and everything in between. Come and visit our garden center and see for yourself all the wonderful items we carry to help brighten up your yard, so you can be the envy of the neighborhood.